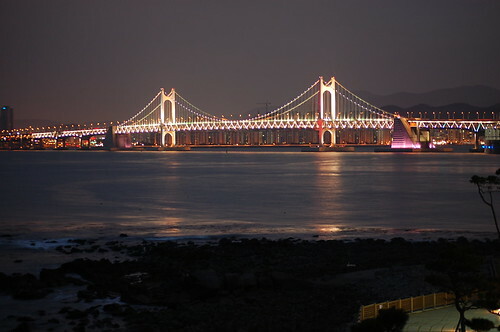 Last weekend we went to Busan. 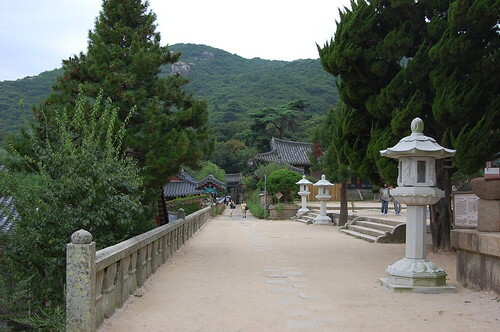 This is the second time I have been to this city (first time was when Annika and Tanja were here), the second biggest in South Korea after Seoul. 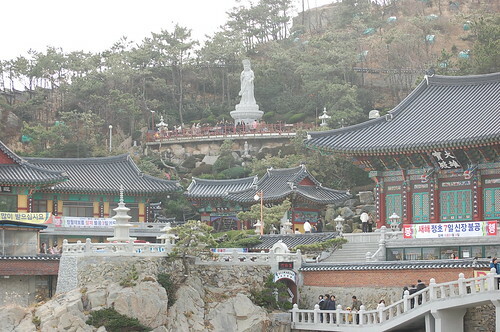 This time I could go to the Geumjeong Mountain, and visit its Beomeo Temple (범어사), on the north of Busan and where you have a very nice view of the whole city of Busan. Unfortunately the day we went to the top it was raining, so besides ending up completely wet, we couldn’t fully enjoy the view because of the fog. Anyway I hadn’t spent such a nice weekend (going to the mountain, beach, dinner and partying with friends…) since I lived in my beloved hometown Fuengirola. 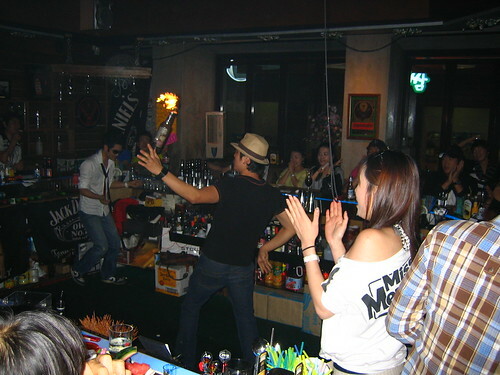 Fire show in a bar in Busan. Pablo studying the mountain before going to the top. 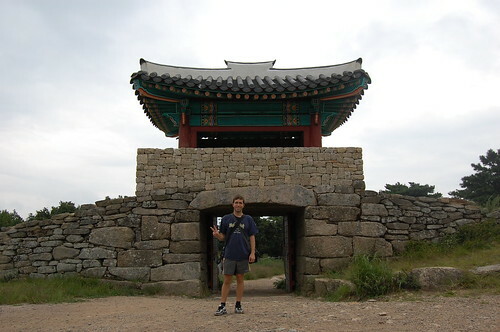 At the North Gate (북문), on the way to the top of the mountain. 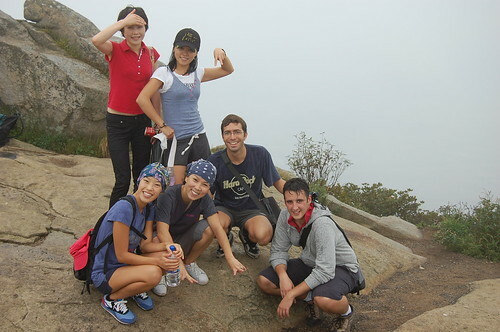 Already at the peak (around 800 meters high), with some Korean friends we made on the way up (in general people in Busan are more open than in Seoul maybe because it’s a southern city with sea where people tend to go out more). 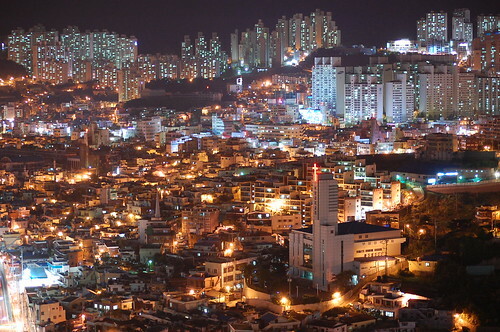 View of Busan at night, from the roof of our building. Korean “princess” with high heels and mini-skirt Haeundae Beach. This beach is also famous for being one of the most crowded beaches in summer. Besides, given that many Koreans are scared to death of the Sun, this beach also has the Guinnes Record to the beach with the most umbrellas. When we asked our hostel owner about this beach, he said it was a very good beach, but it was already closed… Yes, the beach “closed” on august 20th (it’s kind of hard for me to understand how you can possibly “close” a beach), so from that date Koreans just stop going to the beach and you can only see foreigners there. Obviously when we went to the beach we could swim without a problem and the temperature of the water was just perfect. “Closing” the beach just means that they remove the umbrellas. We also ate sannakji (산낙지) for the first time. Sannakji is very easy to make. 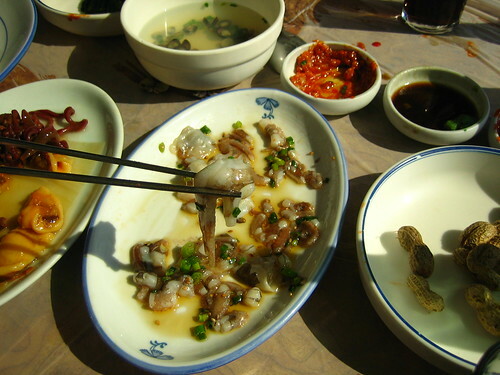 Basically, you just take an octopus (alive), chop it into pieces, add a little sesame oil and species and eat it just like that, while the pieces of octopus are still moving. Another experience to add to the one of eating grasshoppers in Gumi. Recently I got a very nice visit. Annika and Tanja came to South Korea and we spent several days toghether. 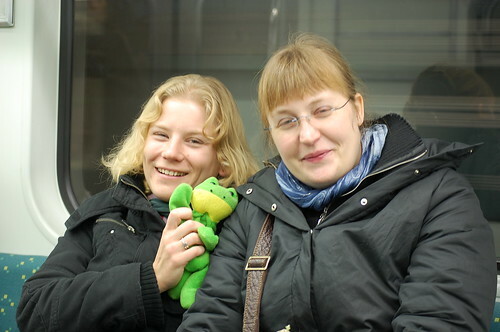 I met Annika and Tanja while I was studing at Indiana State University in the US. 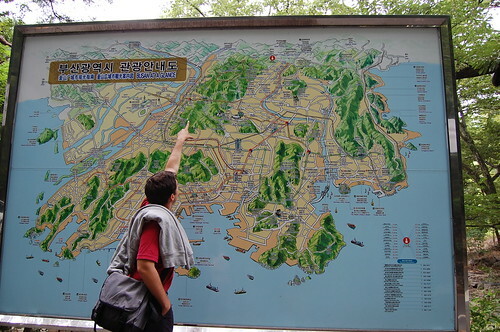 The first place that we went to was Busan, a city in the south-east corner of South Korea, which is popular for its nice weather, fish, beaches, and loud people (just like Malaga!). 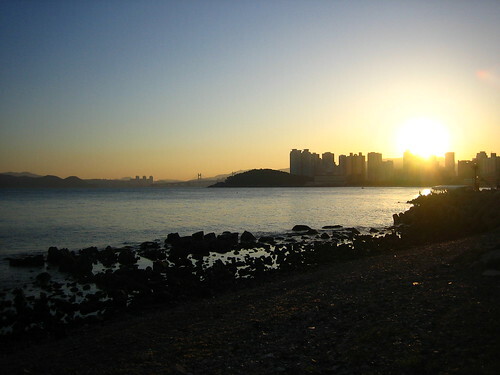 We spent two nights in Busan, from friday to sunday, and stayed at a youth hostel which was actually an appartment that a guy owned and he rented rooms for backpackers. 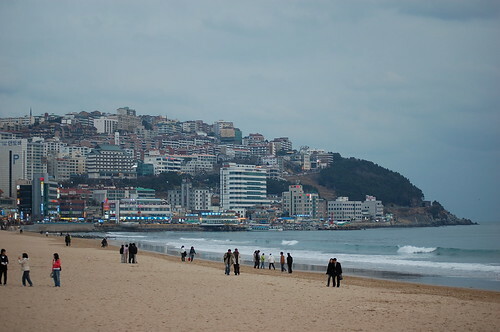 I found Busan very similar to Seoul, but with beaches and warmer weather. Appart from that, lots of people (3.7 million in total, and almost 5 thousand people per square kilometer), and lots of buildings everywhere. 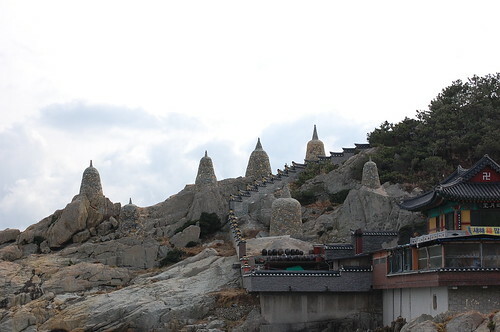 The most remarkable spots that we visited were the Jagalchi fish market and the Yonggungsa Temple. 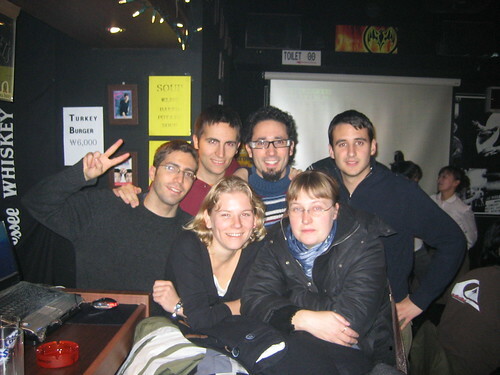 At a bar, from left to right, Manolo, Alex, Annika, Ciro, Tanja, and Pablo. 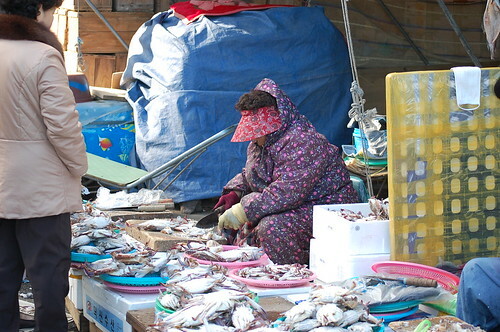 Korean “Ayuma” at the Jagalchi market.